Phil April is currently a Assistant Vice President with Crum & Forster Insurance Brokers Inc, specializing in Excess & Surplus Property placement. Originally from Philadelphia, PA, he graduated from Saint Joseph’s University in 2009 and started his career at United States Liability Insurance. Phil joined Seneca Insurance Company in 2012 and took a leap of faith by moving to San Francisco in early 2015 to help expand the company’s footprint. In his free time, he enjoys cooking, discovering new scotches and wines, and following Philadelphia sports. Ken Lorber is currently a Senior Account Representative at Aon Benfield where he brokers reinsurance treaties including Property Catastrophe, Workers Compensation, and Multi-Line Programs. Prior to joining the Aon Benfield team in San Francisco, Ken started his career at Aon Risk Solutions in San Francisco as an Account Specialist for large commercial accounts. Ken graduated from San Luis Obispo in 2011. From 2011-12, he was part of Aon's Early Career Development Program and completed Aon Benfield's reinsurance Training in 2015. Outside of the office, Ken enjoys spending time traveling, golfing, snowboarding, and watching the Giants. Trevor Smith, Technology Co-Chairperson, joined the insurance industry as an Underwriting Assistant at Zurich North America in September 2014. He graduated from Arizona State University's Hugh Downs School of Human Communication with a Bachelor’s of Science in Communications in August of 2014. Throughout his time in high school and as a Sun Devil, Trevor worked training show jumping horses up and down the West Coast, in Canada, and in Switzerland. After completing his degree program and making an industry switch, Trevor is happy to be out of the Arizona heat and back in the beautiful Bay Area pursuing his insurance career. 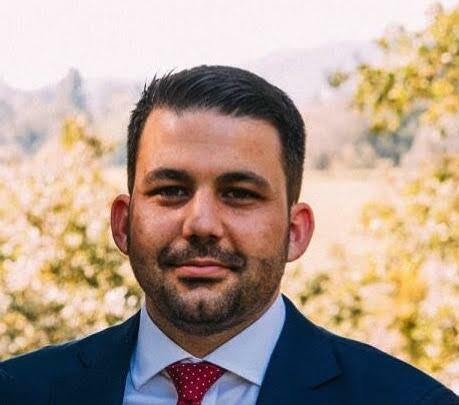 ​Brandon Aasen, Social Media Co-Chairperson, is currently a Property Producer/Broker at CRC Swett, a wholesale insurance broker in San Francisco. He began his insurance career in 2009 in the Risk Management department for Hamilton Bonaduz AG, a fluid measurement robotics company in Bonaduz, Switzerland. In 2011 he moved to the Global Property team at Marsh & McLennan in Los Angeles, and in 2014 he made his move to wholesale by accepting a position at what was then Swett & Crawford in San Francisco. Brandon is a Management graduate from San Diego State University and volunteers at Muttville Senior Dog Rescue in San Francisco. He’s a die hard Chargers and Aztecs fan, and is excited to be working in the lively and active San Francisco Insurance Industry. ​Chris Falvey, Sponsor Relations Co-Chairperson, is currently an Excess Casualty Underwriter at Allied World Assurance Company. Prior to joining Allied World, he started his career at Liberty Mutual as an Excess Casualty Underwriter. Born and raised in San Francisco, Chris graduated from Santa Clara University in 2014 with an undergraduate degree in Political Science and minor in Economics. In his free time, he enjoys weekend trips to Tahoe with his wife and their dog, trying new breweries, following San Francisco sports, and watching rugby. ​Masha Keylin, Treasurer of EIP, is currently the Marketing Director at G2 Insurance Services. Prior to joining G2, Masha was an Account Executive in National Insurance at Liberty Mutual Insurance, leading the company’s relationship management with brokers and clients in the Bay Area. Masha also served as an Underwriter at Zurich Insurance and an Account Executive at Travelers Insurance. Masha earned her Bachelor of Science degree in Managerial Economics from University of California at Davis. Peter Lacovara, Sponsor Relations Co-Chairperson, is a Market Relationship Manager at Swiss Re Corporate Solutions. Following his graduation from the University of Pennsylvania in 2012, Pete joined Swiss Re in a Reinsurance Business Development Function. He then joined the commercial insurance division of Swiss Re in late 2013 in an M&A and corporate strategy capacity before moving into a hybrid strategy and sales role in 2017. In his free time, Pete enjoys traveling, mountaineering, and spending time with his wife and dog outdoors. Erica Smith, Secretary of EIP, has worked as an underwriter for Travelers insurance in the construction department for eight years. Originally from Boulder CO, she graduated from the University of Colorado in 2010 with an undergraduate degree in finance. Shortly after graduating, Erica began her career with Travelers in Denver, CO and re-located with the company to the Bay Area in January of 2017. The move has been a valuable experience both personally and professionally and she enjoys everything the Bay Area has to offer. Outside of the office, Erica enjoys traveling, practicing and teaching yoga, and exploring the outdoors. Shane Sullivan, Technology Co-Chairperson, is a Producer/Broker at CRC Insurance Services, an E&S brokerage. Prior to a career in insurance Shane attended John Jay College in New York City, and upon graduation served the State of Maine as a member of the State Police. When the opportunity to work at CRC presented itself, Shane along with his wife and two children re-located to the Bay Area to enjoys all this area has to offer. Outside of insurance Shane is an avid skier, golfer and coaches youth sports in the East Bay. ​Tom Crosbie, Social Media Co-Chairperson, is an Account Coordinator at Woodruff Sawyer. He graduated from Sacramento State University in 2016 with an undergraduate degree in Finance. After graduation, he moved to San Francisco and worked for 2 years in Wealth Management at First Republic Bank. Tom joined Woodruff Sawyer in spring of 2018. In his free time, Tom enjoys traveling, playing basketball, spending an afternoon at Delores Park, and watching football. Marty Toth , former EIP President, began his career in insurance in July 2011 with ACE USA as a professional liability (E&O) underwriter in San Francisco. Originally from St. Louis, Missouri, Marty moved to Los Angeles and received his undergraduate degree from USC’s Marshall School of Business in Business Administration in 2007. Today, Marty is a professional liability underwriter with Aspen Insurance and in addition to helping manage the SF chapter of EIP with his fellow board members, he is also actively involved with the Insurance Industry Charitable Foundation (IICF) as its Vice Chair of the Western Region’s Associate Board. When Marty isn’t working, he enjoys traveling back to his alma mater to tailgate at USC football games, exploring new things to do in San Francisco, and going on day trips to wine country with friends. Zohreh “Z” Mortensen , former EIP President, has been with EPIC Insurance Brokers & Consultants for over ten years. She is currently a Producer/Risk Consultant at the San Francisco branch, where she is responsible for assessing the risk profile of new and existing clients. Zohreh works to evaluate her clients’ risk exposures in order to stabilize costs and strengthen their brand. Zohreh also runs the EPIC San Francisco Internship Program, grooming college graduates for their future and the future of EPIC. In 2016, Zohreh was awarded "Business America Young Guns 2016" by Insurance Business Magazine. She joined the EIP board in March 2015 and IICF board in 2017 in an effort to give back to the insurance community. ​﻿Allen Kwan is the Head of Sales, West Region for Swiss Re Corporate Solutions. Allen's role at Swiss Re Corporate Solutions is to lead broker and client relationships within the thirteen western states. Prior to his role at Swiss Re, Allen spent several years underwriting highly protected property risk serving multi-national companies. As one of the Chapter's founders his primary role is to advise the board of directors, and serves as the liaison to Golden Gate RIMS Chapter. Allen is a graduate of California State University East Bay, and has a Master of Business Administration with honors from Saint Mary's College of California.